Schematic illustration of the pseudo-Li-ion battery structure. The anode and cathode materials are LiTi2O4 film and LiCoO2/Al, respectively. The Li-ion electrochemical reactions and resistivity measurements are independently performed by using electric circuits, drawn by at the side and bottom of the cell, respectively. "Controlling such exotic properties by applying an external field is one of the biggest continuous challenges in condensed matter physics," state Kohei Yoshimatsu and his colleagues in their recent paper. Their latest results demonstrate that in thin-film structures it is possible to control the transition between superconducting and insulating states using lithium ion electrochemical reactions. Observations of a transition between a superconducting and insulating state in certain two-dimensional materials has stimulated debate within the research community as to what might be the mechanisms operating in such a transition. In addition 'high-temperature' superconductivity, as observed in certain transition metal oxides has prompted an interest in future applications using superconducting properties without the need for extreme cryogenic refrigeration. Recent work showed that electrochemically adjusting the lithium ion content in superconducting lithium titanate (LiTi2O4) can adjust the critical temperature at which the resistance drops to absolute zero. However in these experiments there was no observation of a superconducting-to-insulating state transition. Instead different phases formed and separated. 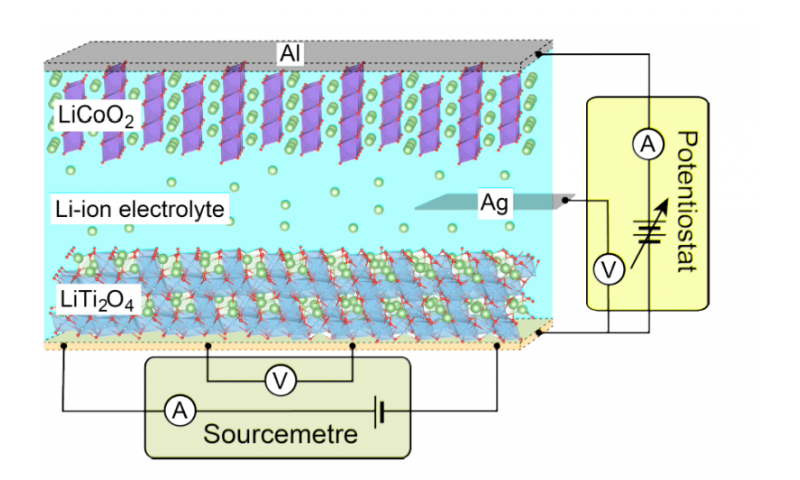 Yoshimatsu and his colleagues at Tokyo Institute of Technology applied an electrochemical potential to thin films of LiTi2O4 in a set up resembling a lithium-ion battery. When the potential is applied lithium ions intercalate into LiTi2O4 'overdoping' the material. Thin films have a larger surface area and less volume than the bulk LiTi2O4 studied in previous experiments, and the Tokyo Institute of Technology researchers were able to observe a transition to an insulating material in the over-doped material. Furthermore by reversing the potential, deintercalation took place and the thin film resumed superconducting behaviour. "This complete reversible transition originates in the difference in potentials required for deintercalation of initially contained and electrochemically intercalated lithium ions," explain the researchers. They suggest the results may lead to a better understanding of the electronic phase of thin layers. First discovered in 1911 by Dutch physicist Heike Kamerlingh Onnes, superconductivity describes a material that achieves absolute zero resistance when cooled past a certain 'critical temperature'. A decrease in temperature decreases the disorder in a system, which in turn decreases the resistance in conventional conducting metals. However due to impurities and defects the resistance never reaches absolute zero unless the material is a superconductor. The critical temperature for the first reported superconductors was close to absolute zero, requiring extreme cryogenic refrigeration. The observation of superconductivity at higher temperatures since has attracted interest because of the potential to apply superconductivity in devices that did not need such extreme conditions. The critical temperature of LiTi2O4 while still low at 13.7 K is considered high for a superconductor. As well as zero resistance, superconductors also expel magnetic fields, which can lead to the unusual sight of a block of superconducting material levitating above a magnetic field. The observation of high-temperature conductivity at around 130 K in iron-based materials raised interest not only for potential applications, but also because iron is magnetic and so raised additional questions about the theory of superconductivity. The role of magnetism and disorder in superconductive to insulating state transitions remains a topic of interest to researchers. Lithium-ion electrochemical cells are well studied for their potential use as alternative energy-storage devices. They involve electrodes of materials with lithium ions intercalated within the crystalline structure, and an electrolyte solution that allows transport of lithium ions between the electrodes for charging and discharging. Lithium atoms are the third smallest in the periodic table, comprising just three protons in the nucleus and three electrons. When an outer electron is lost to form the lithium ion, it becomes strongly electropositive on account of the large fraction of its negative charge lost and the low shielding of the positive nucleus. These properties are good for intercalating into materials in an electrochemical cell. The crystalline structure of LiTi2O4 comprises tetrahedrons of LiO4 with lithium ions at the center, and octahedrons of TiO6 with titanium ions at the center. Excess lithium ions can occupy the empty space in either the tetrahedrons or octahedrons – 'over doping' - as well as replacing the titanium ions, resulting in 'hole doping'. Chronopotentiometric and chronoamperometric experiments to observe the effects of step increases in the potential while a constant current was maintained and vice versa revealed that the potential for deintercalating lithium ions initially present was greater than that required to deintercalate electrochemically intercalated lithium ions. As a result the electrochemically induced transition from superconducting to insulating state was reversible.